To investigate whether prior exposure to hand-transmitted vibration on the day of a cold provocation test affects the cold response of digital arteries. Each of ten healthy men attended two experimental sessions in which their right hands were exposed for 60 min to either contact force alone (5 N) or a combination of contact force (5 N) and 125-Hz vertical vibration with an acceleration magnitude of 64 m s−2 r.m.s. (unweighted). Finger systolic blood pressure (FSBP) during local cooling to 10°C was measured in the second right finger (exposed hand) and the second left finger (unexposed hand) before exposure and at 30 and 70 min after the end of both exposure conditions. Analysis of repeated measures of FSBP during local cooling by means of an autoregressive model revealed no significant difference in cold-induced vasoconstriction of the digital arteries between exposure to contact force alone and combined exposure to contact force and vibration. There were no significant changes in the cold response of digital arteries over time in either the right or the left hand after exposure of the right hand to either the contact force alone or the combined contact force and vibration. The results of this experimental study of the influence of prior vibration exposure on the cold test results suggest that in healthy men recent exposure to contact force and moderate levels of hand-transmitted vibration does not affect the response of finger circulation to cold provocation. 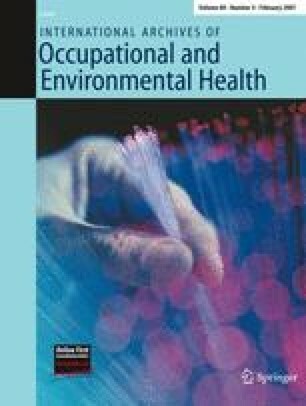 These findings may be of practical importance for the definition of test conditions in the field, especially the length of time required between the last occupational exposure to tool vibration and the commencement of objective vascular testing. This research was supported by the European Commission under the Quality of Life and Management of Living Resources programme, project no. QLK4-2002-02650 (VIBRISKS).